The Scraper Bike Team has opened their first neighborhood bike repair facility called “The Shed”, operated out of a modified cargo container at the MLK Jr Library on International Blvd at 69th Ave. It is open to the public every Saturday, 1-3pm. Bike East Bay is proud to sponsor the Scraper Bike team, and you can make a donation to the team through our donations page. Golden State Warriors guard Shaun Livingston scored 10 points in Oakland’s 103-90 victory over the New York Knicks on Thursday, but what’s missing from the stat sheets are the points he scored off the court – in the hearts of a dozen kids from Oakland who belong to the Original Scraper Bike Team. The group combines art with ingenuity — all with the goal of helping keep kids out of trouble. And Livingston is a fan. For most of the kids, Thursday was their first time seeing a Warriors game in person. They have Livingston to thank for it – he was the one who contacted them and set the plan in motion. “I work at the Oakland Public Library, so he emailed some of the administration at the library and they told me,” said Original Scraper Bike's President Reggie Burnett. “And I was like, ‘Oh, for sure!’ We were stoked to go and overly excited to be here." To that, Livingston added: “How many times are they really going to get to go? Kids from the inner community [don’t] get a chance to go to a professional game of any sorts. They don't have that type of funding – that type of [opportunity.]" Tyrone Stevenson is the mastermind and creator of the Original Scrapers. "It's a blessing to be able to bring them here through this experience. Thank you, Shaun," he said. The team has been riding strong for 10 years now, Stevenson said. It was inspired by the hyphy or hyperactive movement that traces its roots to Oakland-based rapper Keak da Sneak. “We wanted to mimic the cars that rolled around in our neighborhood, and so we got aluminum foil tape, spray paint, customized it out, pimped it out, made it look like an actual car and we've been riding ever since,” he said. Meanwhile, Livingston, who recalled riding his bike everywhere when he was younger, said that he shares the group’s passion. "They're making a positive difference with the youth, trying to keep kids off the street, give them something to do,” he said. “That's what it's about." Tyrone Stevenson, better known as Baybe Champ, is East Oakland's "Scraper Bike King." 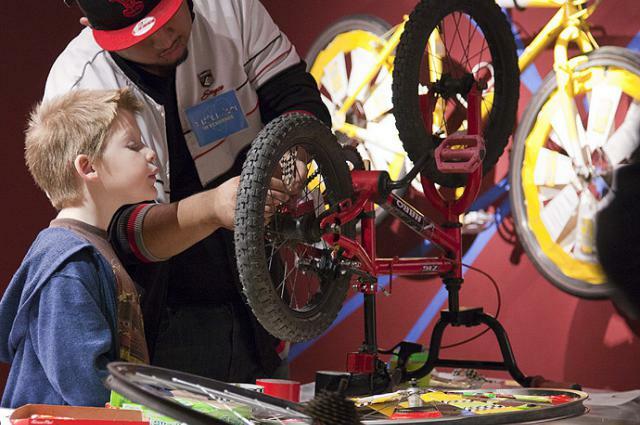 Back in 2007, he and his cousin Avery Pittman started the Original Scraper Bike Team, teaching young people in the Bay Area how to construct, repair and, most importantly, deck out their homemade bicycles. After almost 10 years of cruising, Champ and his crew have finally opened The Shed, their own youth-run bike shop. Scraper Bike Grand Opening of "The Shed"
OAKLAND, Calif., – 20 May 2016 – On June 11 2016, The Original Scraper Bike Team will be leading a bicycle ride around East Oakland to celebrate the grand opening of its first youth-led bike shop for the community. The unveiling of “The Shed” is in partnership with the Oakland Public Library and Bike East Bay. 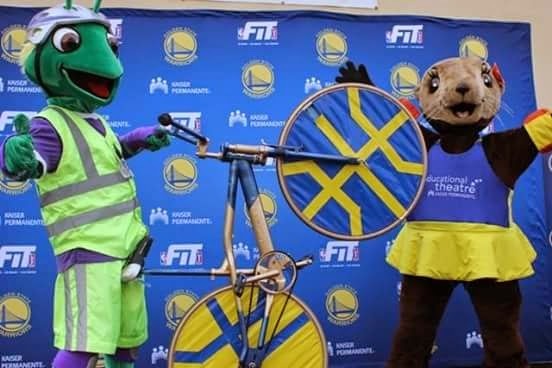 This project began in response to the lack of bike shops in East Oakland at a fix-it clinic run by library staff and scraper-bike volunteers at the 81st Avenue Branch of Oakland Public Library. The new dedicated Scraper Bike Shed, housed in a former shipping container, is the latest step in the Scraper Bike Movement, which gives youth in dangerous communities a positive outlet that is fun, educational and promotes healthy lifestyles. The Original Scraper Bike team has helped youth in East Oakland to refurbish, fix, repair, and customize bikes of all styles since 2008, sparking creativity by promoting positive leadership, and a bike as a alternate transportation choice to hundreds of youth and lower income residents each year. 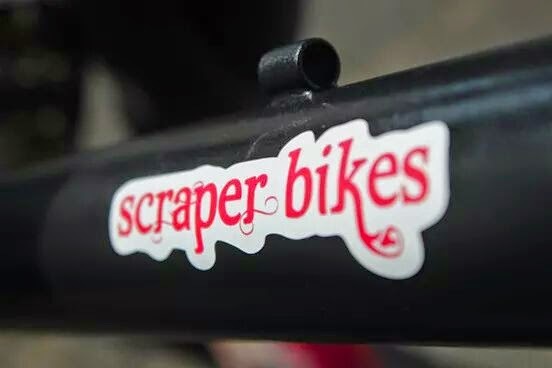 For the first time ever, The Scraper Bike Team will have a dedicated, youth-lead bike shop space to help even more community members of all ages fix up their bikes, learn new skills, and help make their community even greater. At a Oakland Public Library. In 2015, 81st ave library start a bike fix-it clinic. Seeing that there was no bike shops locally, library staff & scraper bike volunteers began offering free bike workshop. Where Patriots could come get minor bike repairs, tuneups and/ or decorations for there bike.now most libraries have Bike parking & locks for visiting patriots. 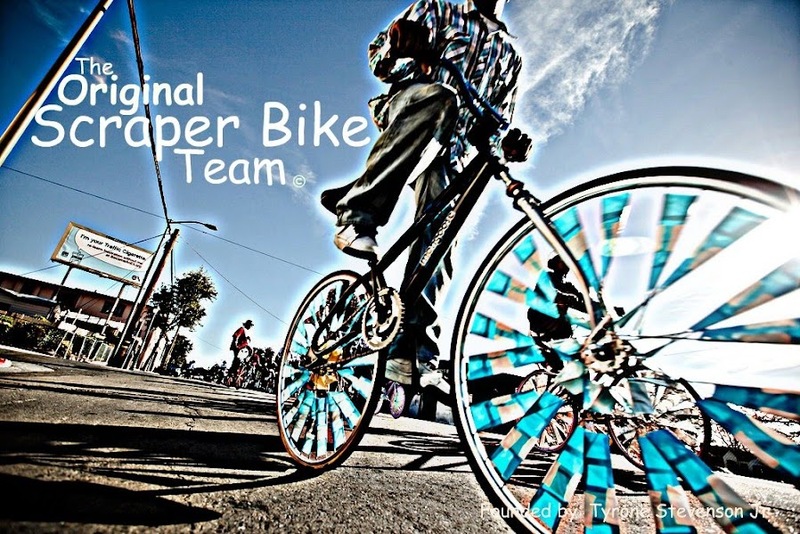 Yes, The Original Scraper Bike Team is filled with elementary and middle school-aged kids, riding in formation through the streets of East Oakland, their bikes festooned in richly colored foil and tape. But there is more to this group please watch and enjoy. Starting off we finally released our 2nd big hit from founder Baybe Champ "On The Scene"
In a nut shell the Original Scraper Bike Team Inc. has been constantly progressing, building new partnerships and collaborations. Heres a brief list of events and features we were apart of in 2014. Also we collaborated with Red Bullentin with a short doc. OMCA is hosting Bay Area experts in the gallery to lead demonstrations and hands-on activities for visitors that exemplify customization. December Art Murmur. Watch him complete the project during his Customizer Residency and learn how to make your own Scraper Bike. Means to customize a bicycle in the scraper style. This may include spray painting the frame and embellishing the spokes of the bicycle wheels using duct tape, aluminum foil and candy wrappers. Colors! Colors! Colors! Think outside of the box when selecting colors for your scraper bike. Recycle: Save and reuse your candy wrappers to decorate the spokes. Think about the whole bike not just the parts.